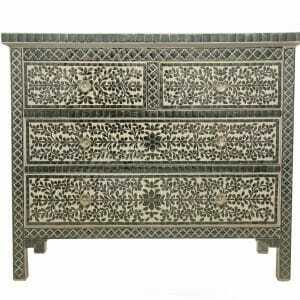 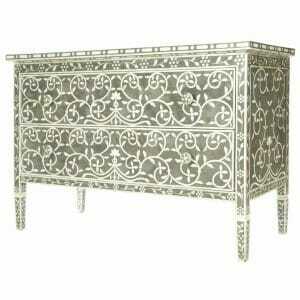 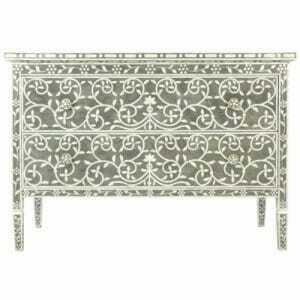 Sumptuous yet subtle, this five drawer inlay dresser gives a soft lustrous sparkle to any room. Particularly fine in a bedroom, where subtle plays of light on the mother of pearl inlay will lift the iridescent colours gently from the white background in a shimmering interplay of light and colour. 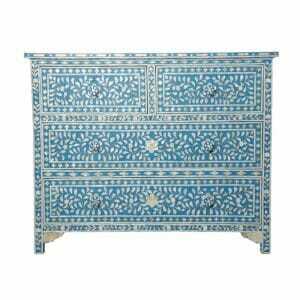 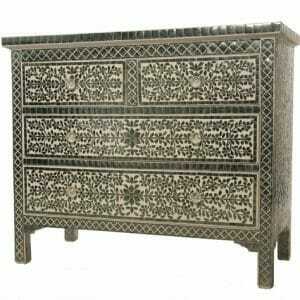 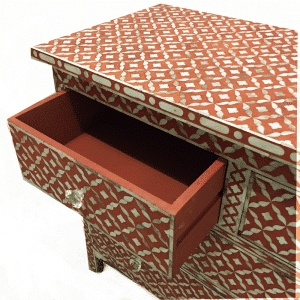 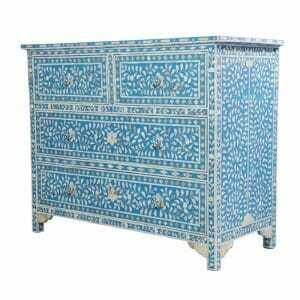 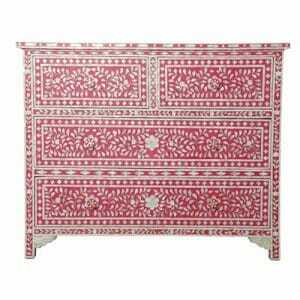 Where to Order Our Decorative Chests of Drawers? 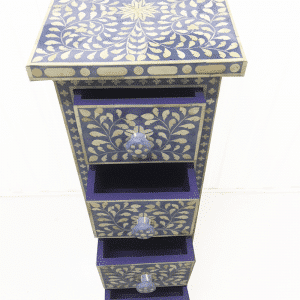 Welcome to Iris Furnishing, a UK company based in Sussex with an online collection home to a beautiful array of Indian Wood furniture, featuring bedside chests, bedside tables, chests of drawers, cabinets, wardrobes and more, everything you need for a matching bedroom suite in ornamented wood furniture for a decorative look in your interior space. 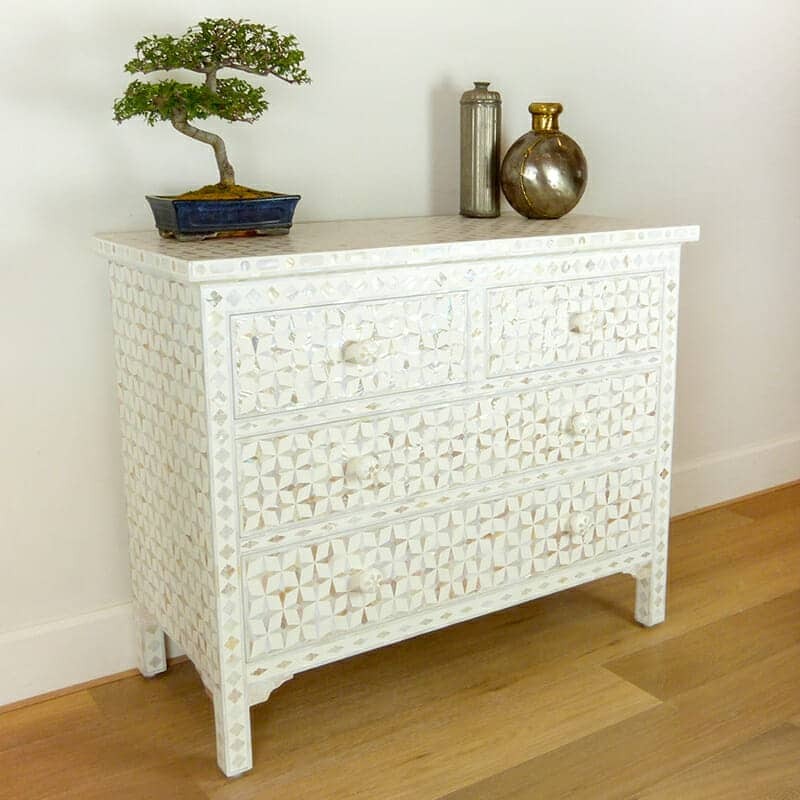 The mother of pearl star chest of drawers in white is ideal for a subtle patterned effect. 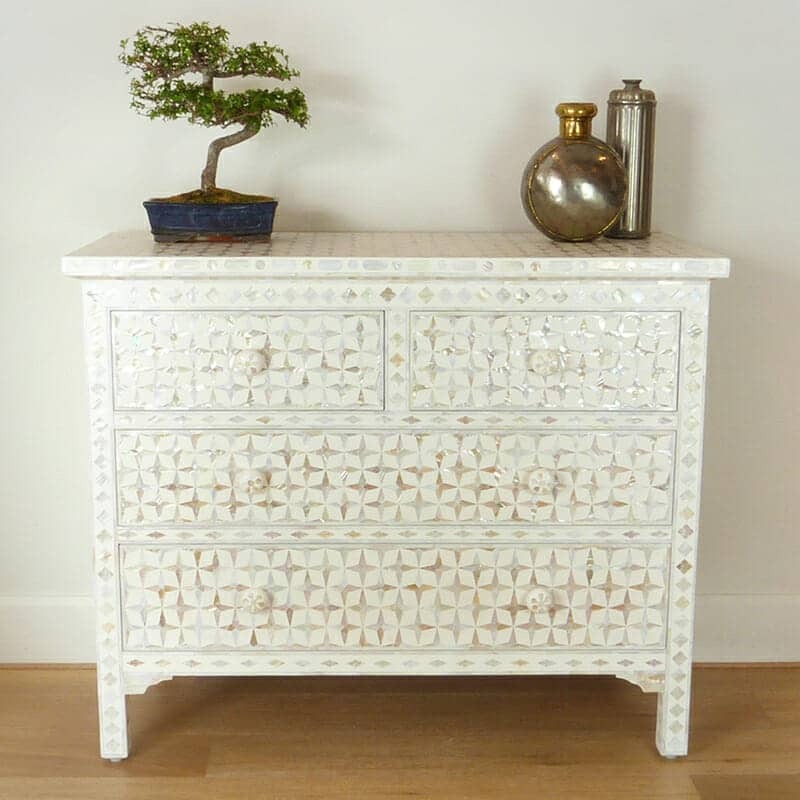 The white background is close in tone to the natural hues in the nacre patterning, which reveals itself by catching the light, giving off delicate pattern indications as you move around the room. 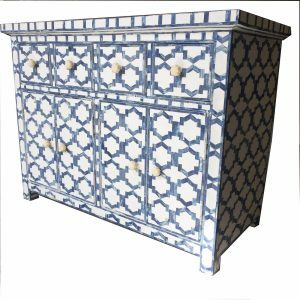 Our decorative ornament furniture is available to order online and we have a showroom in Brighton where viewings can be made by appointment. 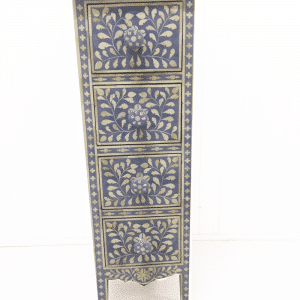 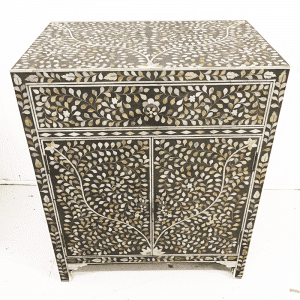 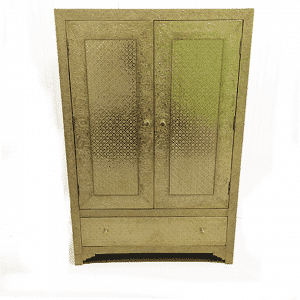 We can tell you all you need to know about this mother of pearl chest of drawers or any other item you’re interested in, so please just get in touch with any questions and we’ll be happy to talk to you about everything to do with our Indian furniture. 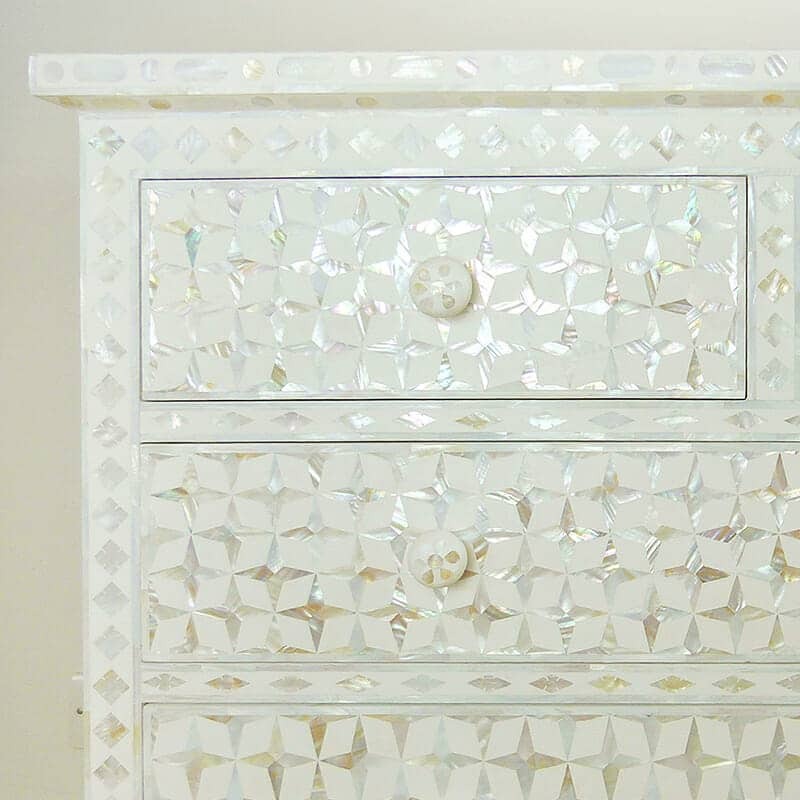 This White Mother of Pearl Chest of Drawers Looks Good – Is It Well Made? We sell solidly-made fair trade artisan wood furniture and this white mother of pearl star chest is one of many to choose from. 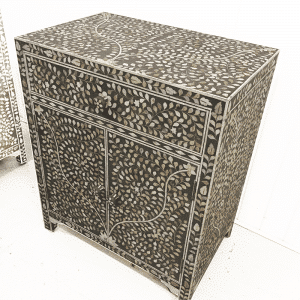 Our online collection of ethical, eco-friendly Indian furniture is sourced from suppliers using the finest quality, sustainably sourced and harmlessly harvested materials to make beautiful decorative furniture that’s not only a joy to behold, but a pleasure to use, too. 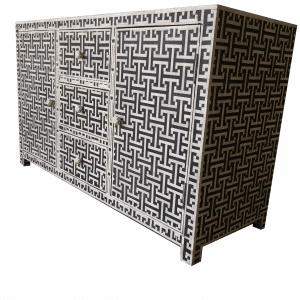 Form and functionality combine in bedroom furniture that works well and looks good. 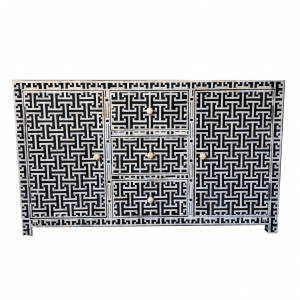 That extra touch of unique appearance in a decorative finish that catches the light and creates the feeling of space in a room. 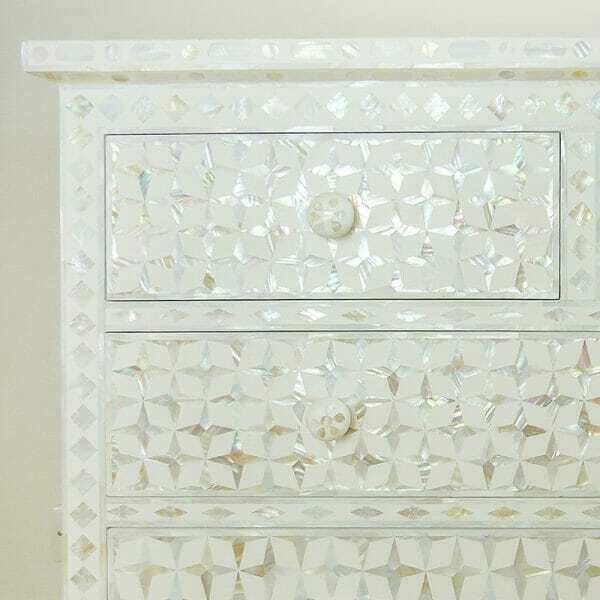 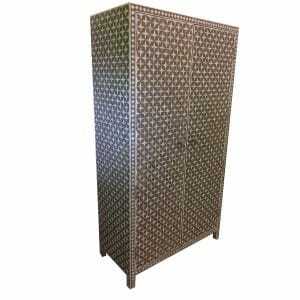 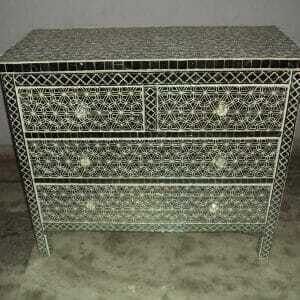 Bespoke Bedroom Furniture Suite with your Mother of Pearl White Star Chest? 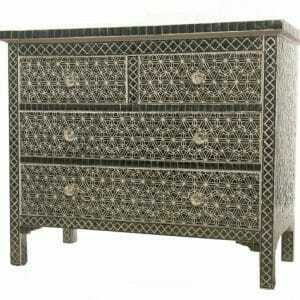 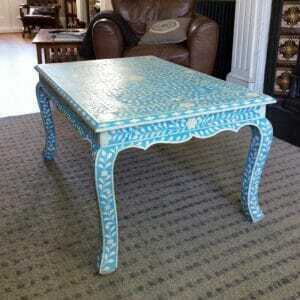 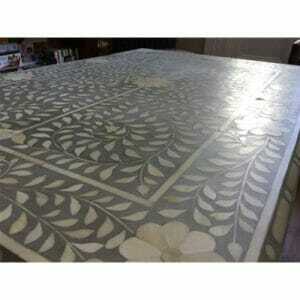 At Iris Furnishing we offer a made to measure furniture service at – we are often told – surprisingly reasonable prices. 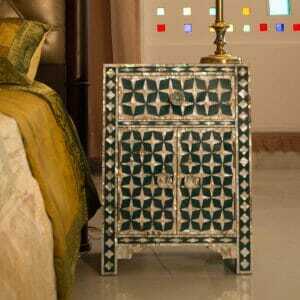 As every piece of Indian wood furniture hand-crafted by the artisans in Rajasthan is a unique and original piece of decorated furniture, your individual bespoke requirements for your bedroom furniture are welcome and we can help design your ideal home furniture solution for a truly stunning custom made interior décor look. 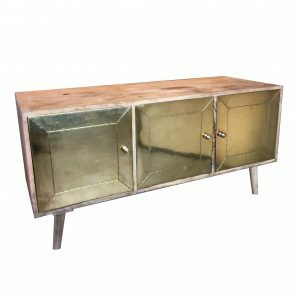 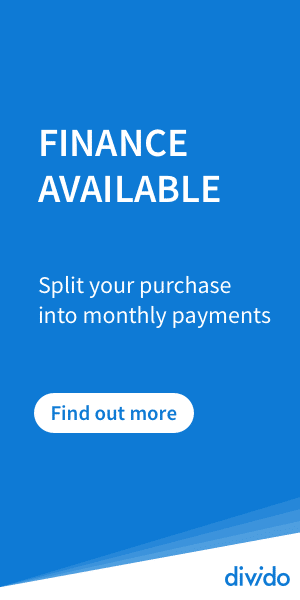 Get in touch with us with your questions, or if you already know the measurements you need, we can answer you with a quote directly. 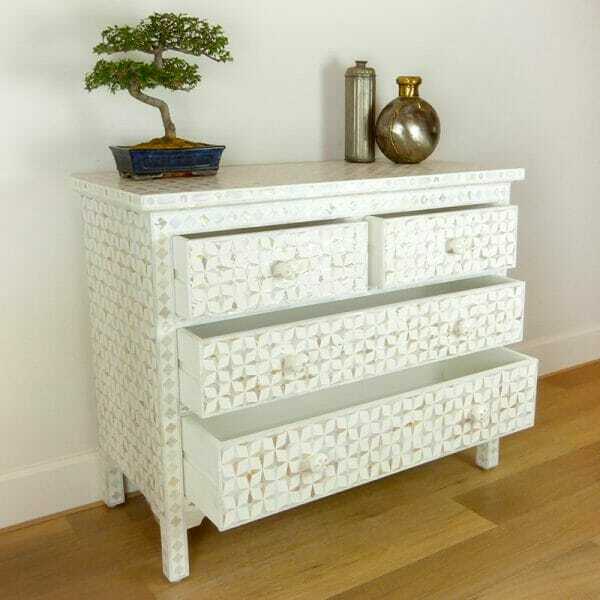 Will My White Mother of Pearl Chest of Drawers Look Good With My Décor? 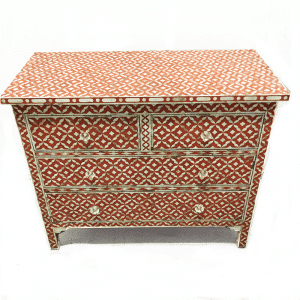 The White Mother of Pearl Star Chest matches white, neutral and coloured furnishings, mixing well stylistically with a combination of plain and patterned soft furnishings. 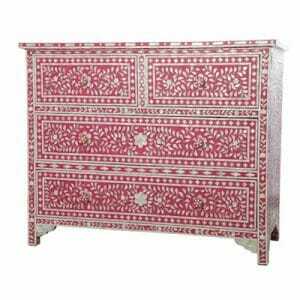 Layers of understated, neutral tones accented with the occasional blush of muted colour in a room will build a soft and sophisticated bedroom décor look with this ornate piece of unusual white wood furniture. 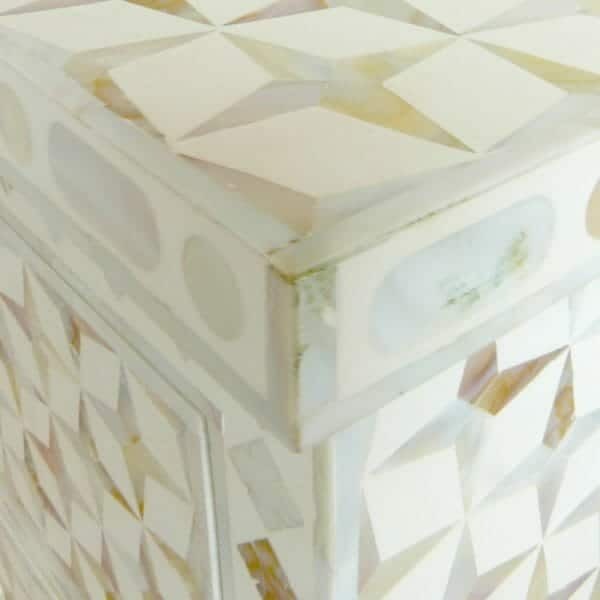 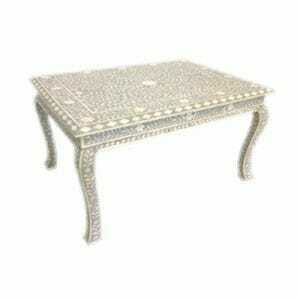 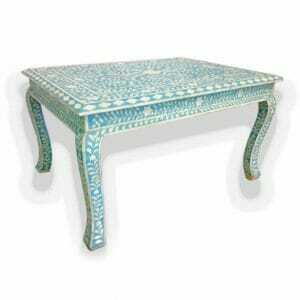 Designed to look good against grey, white or coloured walls, the white mother of pearl inlay furniture is made with genuine mother of pearl, hand harvested in India and cut and carved into the geometric shapes that make the unusual star patterning on this solid-framed furniture stand out from some of our other inlay furniture. 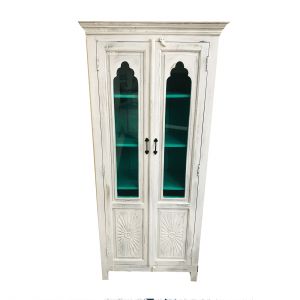 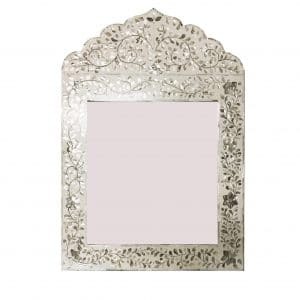 For a really distinctive theme to your décor, order this with its matching white bedside chest and consider a full bedroom suite, to include a matching mother of pearl mirror and wardrobe, made to measure.